Effective service delivery capabilities are critical to the transformation of the Internet into a viable commercial infrastructure. At the present time, the architecture of the Internet is inadequately equipped to provide these capabilities. Traditionally, overlay networks have been proposed as a means of providing rich functionality at the upper layers. However, they suffer from their own drawbacks and do not constitute a perfect solution. 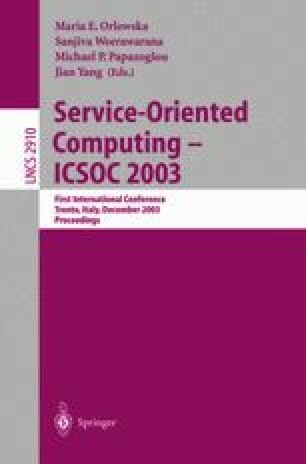 In this paper, we propose a novel, overlay based Service Oriented Internet architecture that is meant to serve as a flexible, unifying and scalable platform for delivering services over the Internet. As part of this architecture, we introduce a new two-level addressing scheme and an associated service layer. We also describe the functionality of the new network elements that are introduced, namely service gateway and service point-of-presence, and subsequently discuss algorithms that are responsible for distributing service reachability across the overlay framework. We also present a few examples of application services that benefit significantly when deployed on our architecture.